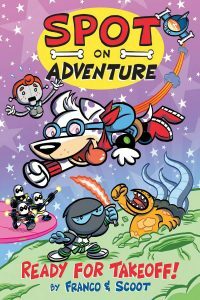 More out-of-nowhere stuff: This time Action Lab brings us another new canine superhero in Spot On Adventure: Ready For Takeoff! “Join the action-adventurer Spot as he embarks on the mission of a lifetime! Saddled with the brand new partner that he never wanted, Golly-G the robot that wants to be real, Spot is hired to rescue a princess from the clutches of the bad guys. All the while being tracked by the notorious bounty hunter, the Moe Moe Blaster… an assorted allotment of various other bounty hunters… the Galactic Space police… a Space Ninja named Konuichi… as well as the biggest fish named Fluffy you’ve ever seen!” Got all that? This 96-page full-color graphic novel for all ages (written by Franco and illustrated by Scoot) is available now at MyComicShop.com.